Terence Blanchard is more than a brilliant jazz trumpeter. His long-standing quintet is one of the most flexible groups in jazz, and his work as a composer of film soundtracks is distinctive. Terence Blanchard could have been overshadowed easily enough. He was a childhood friend of trumpeter Wynton Marsalis growing up in New Orleans, and it might have seemed that he skimmed along in Marsalis’s wake for some time: at New Orleans Center for Creative Arts (NOCCA), studying with Ellis Marsalis, moving to New York, and then taking the older player’s seat in Art Blakey’s legendary Jazz Messengers band from 1982 to 1986. He even started his own hard-bop quintet with a kindred New Orleans saxophone player after leaving Blakey—just like Wynton. And they recorded for Columbia Records—just like Wynton. 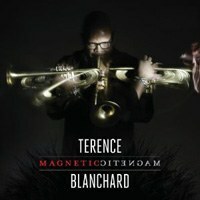 Terence Blanchard never was Wynton Marsalis, of course, but instead very much his own man with his own sound. Not only were his solo albums increasingly different and atmospheric, but a gig playing the trumpet parts in Spike Lee’s jazz movie, Mo’ Better Blues (1990), led him to composing the soundtrack for Lee’s 1991 Jungle Fever. Dozens of other film scores were to follow. Magnetic, just released on Blue Note Records, is the latest of Blanchard’s jazz albums featuring a long-standing quintet and guests. It follows a string of impressive and ambitious jazz albums, most notable 2007’s A Tale of God’s Will: Requiem for Katrina, which was nominated for a Grammy and which is simply one of the best jazz recordings of the new century. Blanchard talked to PopMatters about his quintet and its guests on Magnetic, about the Blakey legacy, about his soundtrack work, and about making it as a modern jazz musician in an era when the financial benefits of jazz are limited. Magnetic is a real “band album”, with tunes written by different sidemen in the band as well as yourself. Tell us a little about your quintet and how this work relates to you time with the Jazz Messengers. These guys are really talented. Pianist Fabian Almazan’s talent has grown tremendously in recent years. Kendrick Scott, my drummer, is a great musician and great person. And he can play anything—you can’t make a judgment based on one situation. I did a tour with the Monterey All-Stars, and watching Kendrick play with James Moody and Benny Green was something else because you wouldn’t normally associate him with those guys. His playing changed because he was playing with them. When I started out, I was playing with Art Blakey, and he firmly believed that to find your identity musically, you have to compose. When you write, you have to commit to paper what your ideas really are. It was a true honor being in Blakey’s band—and for him to ask us to write. Once I did write, I could see how Blakey could develop his musical ideas by what he did behind the compositions. Blakey created a safety net for the musicians. Being in his band was like being marbles on a coffee table – you could do a lot, but if you got to the edge, he would put his hand out and pull you back to the center. Magnetic covers quite a bit of ground—tender acoustic ballads, some groove-based music, use of electronics. What ties together the music in your view? I don’t think about having a “Blanchard sound”—it’s about playing with guys who are pushing me in areas I wouldn’t have gone down without them. When I had Eric Harland on drums, we started doing things in 5/4 that I wasn’t used to. Fabian is on another plane, harmonically. The players in the band stretch creatively every night. Everyone should feel safe musically. Experiment. The statement I’m making on this record is that this band is freedom—it’s free. When we talk about jazz, we talk about the freedom of the music. Everyone on this record is someone who has had a great career and a musical presence. If you are hung up on maintaining the tradition you’re never going to be yourself. This is a music about breaking the tradition. The easiest thing to do is to play like the old guys that everyone loved. It’s a scary to just be yourself. I call the guys in my band “fearless”. The presence of Ron Carter and Ravi Coltrane on this record feels kind of fun and classic – like when Trane played on Tenor Madness with Rollins. Is this kind of collaboration within the jazz community still alive and well today? That track was supposed to be a break from the other things, where we could just have fun playing together. It’s supposed to be wide open and free. I don’t want to say it’s wild abandon, but there is a flow that is there. I wanted to have Ravi on one of my records because I love his playing. Talk about the presence of guitarist Lional Louke in your band. His sound can be an outlier on some tracks—outside the jazz quintet tradition. How does that inspire you or push you in new directions? You add Lionel Louke and he sparks things. That’s how the guys in my band operate. Everyone responds to everyone else. I knew that Lionel comes from the group, and bringing him back here he would fit in and he will bring something in that folks respond to. You know, the best compliment we ever got was this, “Man I always heard of bands that play different every night, but you guys really do.” We don’t set out to do that, but we’re just open musically. Having some different musical presences in the band adds to that. Your last for Blue Note was your Katrina recording. Can you talk about the continued presence of New Orleans and your New Orleans musical legacy in your music. I’ve always found it interesting that New Orleans was a place of innovation, but it was so powerful that it’s created a style. Now when you hear “New Orleans” you think of a particular style. I just think of innovation—how Louis Armstrong was ahead of his time. In my experience, New Orleans musicians all talked about “concepts”—what they were working on. These dudes all were trying something different. That was my indoctrination into the world of art. Find your voice, be who you are. Make art. These were the guys who imprinted my musical thought process on me as a teenager. So, while I still carry the New Orleans gene, rhythmically and melodically, there’s another side, a conceptual side, that has always had a bigger effect on me. The David Simon TV series Treme has been an interesting take on New Orleans and on jazz as it relates to that city. Because your old partner Donald Harrison has been involved in the show and because the young trumpeter on the show is in some ways modeled on Donald as a modern jazz musician with roots in traditional New Orleans parade music, I wonder if the show’s dramatization of the relation of modern jazz to New Orleans is striking a chord with you. People confuse the fact that it’s called Treme and not New Orleans. The show captures that neighborhood very well. The show tried at moments to capture all of New Orleans. I’m in the last episode playing a song from Magnetic, actually. The show was a love letter to New Orleans through a certain community. But it wasn’t all-encompassing. Ultimately the dramatization on that show—with the young trumpeter Delmon being torn and having to choose between living in New York and living in New Orleans isn’t what my career was about. Wynton Marsalis and I talked when we were young about moving to New York and learning more about jazz, experiencing the world. Even the generations before us said to us, you have to go to New York. I did move to New York to study and play. And I did move back to New Orleans in 1995. I just wanted to be quiet and be home. Can you talk about how your work on movie soundtracks has influenced how you approach the quintet and your jazz work? It seems that the use of electronics on this record in some way creates more sense of “orchestration” and sonic texture. That’s exactly right. Working in the film world, I got familiar with electronics. I gained that knowledge, and use it in film all the time. Why be apprehensive about using it with my band? It’s not about making music that people might call “fusion”. I just want to serve the composition. You seem like a thoroughly modern jazz musician—coming at music from so many different angles. Besides your writing for movies and the jazz quintet, what are the other parts of making ends meet as an uncompromising modern jazz player? It’s not easy, man. The bass player Dave Holland told me to just focus on my art. And it is a struggle keeping the band together. Is it worth it? I think it’s worth it. The struggle is to maintain musical integrity. It’s rough at times, but it’s also fruitful. You always want to make sure that people get who you are. People will pigeonhole you. I do interviews to get my own vision out there. You want people to have a backdrop to what they’re listening to. The reason for the passing over the distinctions is to determine who you are. Who do you want to be? You have to start understanding who you are. You take things you’ve learned from Miles Davis and use them. But I love other things as well. If you’re truly honest about what you like and don’t like, then it comes together. But Art Blakey used to tell us—if you have something to offer, the world will beat a path to you door.